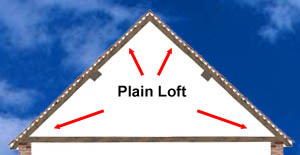 The following loft layouts represent some typical scenarios where lapVent can be used to improve roof space ventilation. 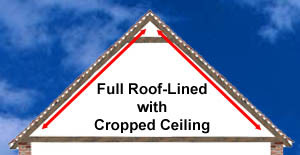 Warm air rises creating a stacking effect in the upper reaches of a roof. Therefore, eaves ventilation cannot cope alone and there is usually a requirement for higher as well as lower ventilation points. Larger roof voids may have the space to hold rooms with full walls and ceilings, but there is the danger of creating a dubious, hermetically sealed in environment, where roofs cannot breathe properly - which is not in the least bit healthy. 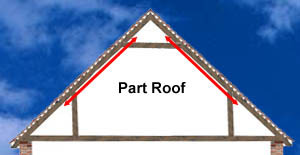 Partial rafter-line ceilings should have a clear area acting as an air-bridge between layers. Such cavities should interconnect with any separated roof spaces, if not, counter batten as below. Full rafter-line ceilings can create airless living conditions and there needs to be provision for some kind of ventilation. 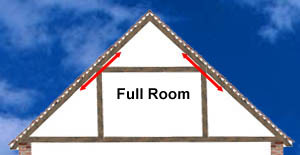 To establish a clear airflow cavity, counter-batten between rafters and ceiling boards, this will link isolated areas and form a full cross-rafter venting system.